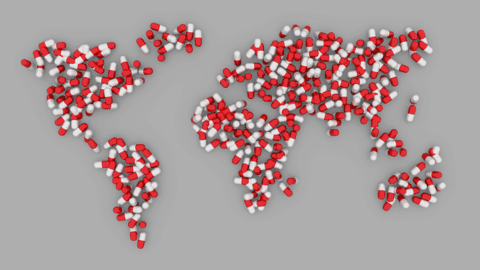 Did you know that 47,055 drug overdose deaths occurred in the United States in 2014?! Also, did you know that 8.3 million children under 18 years of age lived with at least one substance dependent or substance-abusing parent? As you can see, drugs are a big problem in Oakland because they cause death, abuse, and the neglect of children. Firstly, drugs are an issue in Oakland because they can lead to death. Drugs affect the user’s body. In an article written by Recover Gateway (an organization that provides treatment to drug & alcohol users), there were facts about how drugs affect your body. In the article, the writer said, “Drug use can cause cardiovascular conditions ranging from abnormal heart rate to heart attacks. Injected drugs can also lead to collapsed veins and infections of the blood vessels and heart valves” (Recover Gateway). The use of drugs can affect the user’s body. These conditions are bad because they’re lethal. Using drugs can affect the drug user’s daily life. If the user’s body continues to do the drug, problems can occur which can affect your life because the user of the drug will have trouble sleeping, breathing, and living their daily life. If the use of drugs continue, that can lead to heart attacks, stroke which may possibly lead to death. Drugs often lead to death, when a person over doses. An overdose is when somebody has too much of a drug and their body cannot cope with it so it shuts down. First off, on CNN there were statistics about how overdoses are serious. 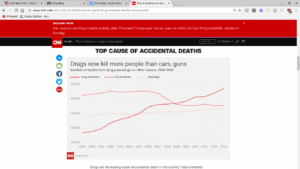 In this data set, it is obvious that throughout the years, drugs have became a bigger and more serious problem than car accidents and shootings. In the early 2000’s, drugs weren’t an issue as much as car accidents. Compare the amount of deaths that has occurred from the early 2000’s to this day. It is very shocking to see that drugs are way bigger of a problem than car accidents and shootings. Secondly, drugs can lead to abuse and neglect of children. According to the organization Partnership for Drug Free Kids, through a study in Kentucky they discovered that there was a connection between the use of drugs and alcohol and the parents. The study found that, “The newspaper reviewed 85 cases from 2009 and 2010. About 59 percent refer to substance abuse by parents or caregivers” (Partnership for Drug- Free Kids). This quote is telling us that more than half of the cases have a connection between drugs and alcohol and parents. This is shocking because parents are supposed to be the ones to protect their kids, but instead, the parents are influencing their family negatively. The article also proves that there are different types of abuse towards children. “A mother admitted taking an anti-anxiety drug before rolling over on her daughter in her sleep, causing the little girl to suffocate.” This is an example of one way that drugs and alcohol can harm the children. This mother now has to carry that guilt of almost killing her daughter which is super scary. This mother also did not know what she was doing because she was too high or drunk off the drugs. Although this evidence is coming from Kentucky, there is a similar trend in Oakland because drugs and alcohol are a huge problem. To conclude, drugs are a bad thing to use because it can cause abuse and neglect of children. Some may argue that adults use drugs and alcohol to relieve stress but it is possible that drugs can cause deaths, harm, abuse, and neglect. Finally, not only do drugs affect the body in a negative way but they can cause adults and parents to harm their kids. To this day, drugs have killed many innocent people and have risked the lives of many young kids. Consequences of Drug Use by Kayla is licensed under a Creative Commons Attribution-ShareAlike 4.0 International License. One sentence you wrote that really stood out to me was “This is shocking because parents are supposed to be the ones to protect their kids, but instead, the parents are influencing their family negatively.” I definitely agree to what you stated because it is said that parents should “practice what you preach” and be the positive role models to their children. However, when parents are telling their children to “stay away from drugs and alcohol” while doing drugs and/or alcohol, the message being sent to children kind of defeats the purpose of “practicing what you preach”. It essentially gives a child the mindset of “if my mom/dad is doing that, then it must be ok”. You did a great job on covering the possible effects on the varying types of drugs! I apologize for this late response but I read your comment and I have to tell you that I definitely agree with you when you said how when parents tell their kids to stay away from drugs/ alcohol. I agree with you because they should be a good role model for their children! That sentence stood out to me because we both agreed to that idea. I think we both agree on my post about how drugs and alcohol can affect people and also kids at a young age. Thank you for taking your time for writing to me! It’s good to know that someone agrees with me. I hope that you enjoyed reading my blog! I hope to hear from you again.